Would Re-Entry Improve Your Edge? I had an opportunity this week to review and comment on some trades, from a trader who is using the YTC Price Action Trader strategy in the emini-Russell futures markets. While not yet achieving consistent profitability, there are very strong signs of this potential in the future. One strength that was clear from the start was that, in the vast majority of trades, this trader is clearly identifying the right market bias and generally reasonable trade locations. He is picking areas in the chart that in most cases offer follow through of at least two times risk. But there is also a weakness that was clearly evident. These multiple-R opportunities were not being captured. 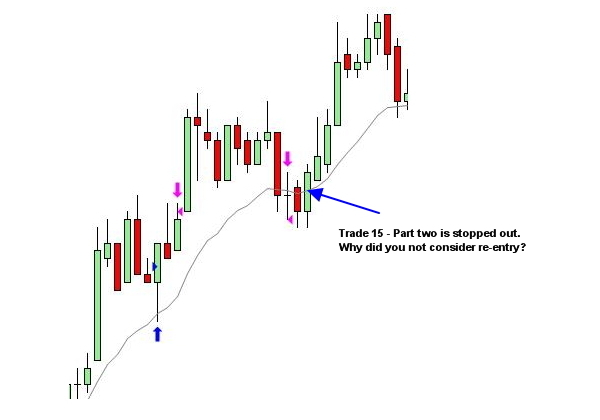 Trades were typically stopped out or scratched early, leaving the trader to watch from the sidelines as price moves on to profits without him. From a psychological perspective, re-entry can be hard to do. But we have seven trades here that were stopped out or scratched while not invalidating the trade premise. Re-entry in all cases offered >= 2R profits. In some cases, much more than 2R. This is not to say that all exits should be considered for re-entry. If it's clear that your whole trade idea was wrong to start with, or if it was ok at the time but now considered invalid, then don't seek re-entry. But if the trade idea is still ok… at least try to re-enter. Review your own trades from this perspective, if you're not already doing so. Are you correctly identifying the market bias and trading in locations that offer good profit potential? And if so, are you capturing a reasonable part of that profit potential? Or is your trade management plan and mindset leaving much of these profits on the table? 1. Perhaps active trade management is not the best style for you! 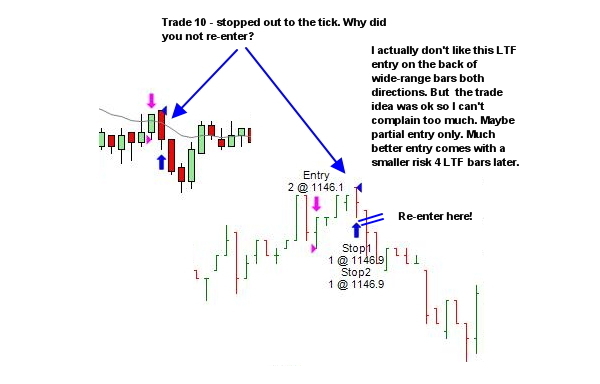 While you're tracking results for trades you should also make sure you track the result had it simply been left alone to hit either the stops or the predetermined targets. Some people are not suited to an active trade management approach. Provided they've sufficient skill at identifying quality trade locations, they may do fine with a passive approach. Set the trade and walk away till one of the other is hit. I'm not saying it is the best way for you. Just track it for now. If the results from a significant sample of trades exceed your active management results, then you should consider trailing a passive style of trade management. See how it fits with your psych! 2. 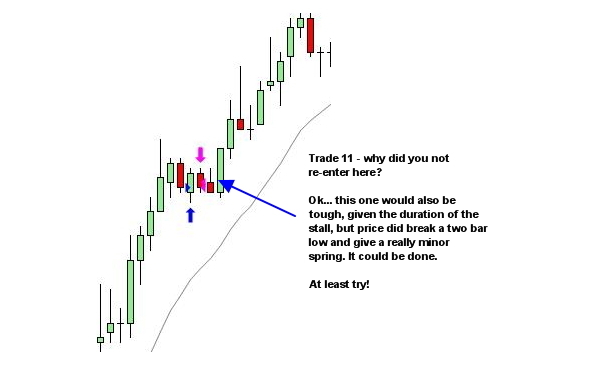 If you do like active trade management, then you need to learn to re-enter. 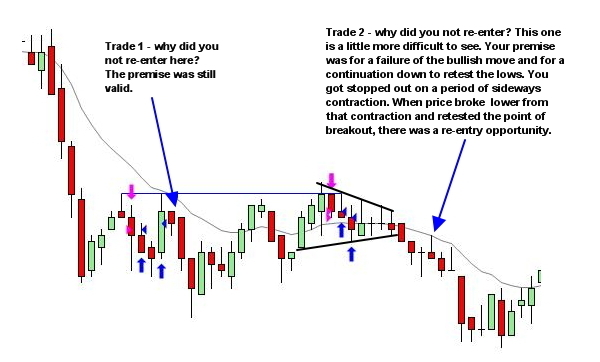 The fact is… we cannot know what the best entry strategy will be, for any particular trade, until we review the trade with the benefit of hindsight. It is therefore unreasonable to assume we will always get the entry right first time. In many cases, a stop or scratch of a trade does NOT mean the trade is over. Keep focusing and look for a re-entry opportunity. Re-entry is a necessary part of trading. We've discussed it before. And we've discussed the mindset required to operate in this way. It's not easy. It takes practice. It takes a different mindset. And like everything in trading, it will be a process of continual skill development. Look at your charts. Look at your stats. Perhaps re-entry has a place in your trading and can help improve your edge in the markets.